Another month has come and completely flown by. 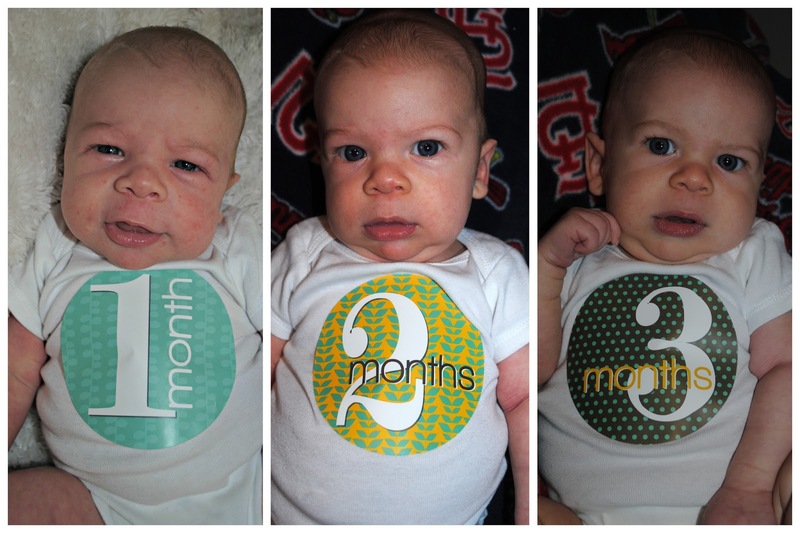 Hard to believe my little big guy is 3 months old. 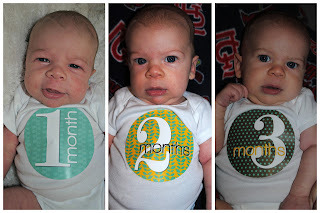 Unfortunately, he doesn't get a 3-month well baby check up - so I have no exciting stats to share regarding his growth progress. Because we were at the pediatrician's office twice last week, I do know that he weighs 10 lbs 5 oz. A whopping two ounces more than he did at 2 months. Which is weird because he sure looks like he weighs a lot more! This tiny boy steals another piece of my heart every single day. He smiles all the time, loves to be talked and sung to, squeals in delight, and giggles/laughs every once in awhile. I can't wait for those giggles and laughs to become more frequent. Being back at work is not easy. At all. But luckily I've been staying busy and keeping my brain occupied. It's all I can do to obey all posted speed limit signs when I'm driving to Jessica's to pick him up. I felt compelled to compare his monthly progression photos so far, and I am so happy I did. This latest photo may even resemble me a tiny bit! !